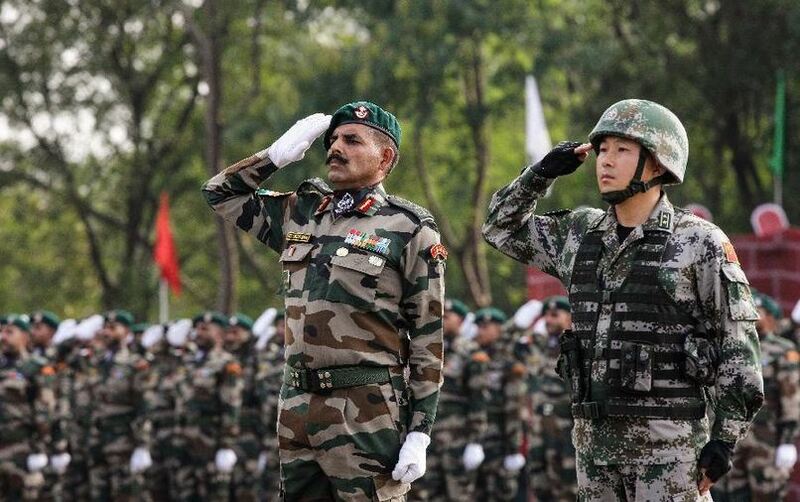 (TibetanReview.net, Sep21, 2015) – Amid continuing cross-border incidents, China and India are to join for drills in Oct 2015 as part of what has been stated as a confidence-building measure. The latest tension arose as a result of the construction of a watchtower by the Chinese People’s Liberation Army (PLA) in a disputed Line of Actual Control (LAC) spot between Indian and Chinese controlled Kashmir region. It resulted in a standoff which began in the night of Sep 11 and was only resolved on Sep 15. The Indian Army and the Indo-Tibetan Border Police discovered a PLA watchtower in Burtse, northern Ladakh, 1.5 kilometres in Indian claimed territory close to the “border patrolling line”. Indian Army forces were reported to have demolished the watchtower which consisted of a monitoring camera and solar-panel mounted on the hut of a roof. Top sources in the Indian Army said additional forces were being sent as reinforcements to a believed PLA buildup, said a report by The Tribune posted on the valuewalk.com website Sep 20. It added that following the destruction of the watchtower, 90 PLA troops took position nearby to which India responded with its own reinforcements. It added that both sides had by Sep 11 night moved an additional platoon of troops to the area. Although by Sep 14 a small-scale pullback took place, the forces from both the sides stayed in the area into the following day as efforts were undertaken to defuse the situation. The report suggested that the above stand-off occurred despite the fact that typically, when troops from either side come into contact with each other along the “border patrolling line”, they withdraw as per established protocol. This consisted of a standard drill by which banners are shown by opposing troops asking for a withdrawal to their respective territory. Additionally, it added, there is a mutually-accepted principle that no new defence-construction should be undertaken in disputed areas. Officially, China has denied Indian media reports of a standoff. Speaking at a regular Foreign Ministry briefing on Sep 14, spokesman Hong Lei had stated, “As far as I know, there is no such face off in the border area. Chinese troops are performing their duties on the Chinese side of the border.” He has added that China was entitled to carry out “relevant activities” on its side of the border. Finally, on Sep 15, India and China engaged in flag meetings along the LAC to defuse tensions. Opposing commanders met at the border personnel meeting (BPM) points at Daulat Beg Oldi and Chushul from 3pm to 5pm while both sides agreed to maintain the existing peace. Ultimately the situation was resolved without any further incident, the report added. The latest incident is seen as bringing into question the effectiveness of a mechanism which had been agreed on for cross-border consultation to avoid disputes between border personnel since the meetings between Indian Prime Minister Narendra Modi and Chinese President Xi Jinping early this year. The report said the above standoff was not an isolated case as they do happen regularly due to differences in perception of line of control. It added that Ladakh had emerged as a major flashpoint between in recent years. This included a fairly serious incident in Apr and May 2013, when a 21-day standoff erupted after PLA forces pitched five tents near Daulat Beg Oldie. In the upcoming symbolic confidence-building measure, China and India will hold another “Hand-in-Hand” (HiH) military exercise. The exercise will be held at Kunming, capital of China’s Yunnan Province, from Oct 11 to the 23. The report said India will send a detachment of soldiers from its famed Naga Regiment to the exercises. This will be the fifth annual HiH exercise to be held since 2007.